EaseUS Todo Backup is a very comprehensive backup and recovery program which does more than just backup files. The application is rather full of features, as can be seen from the list of features it includes. You can use the program to fully recover files, back them up to different locations and take advantage of the advanced settings on offer. Even though the program has a simple-looking interface, digging a bit deeper exposes some of the advanced features that have been included in this free tool. Version 11.5.0.0.20180816 is a freeware program which does not have restrictions and it's free so it doesn't cost anything. For security reasons, you should also check out the EaseUS Todo Backup Free download at LO4D.com which includes virus and malware tests. Additional screenshots of this application download may be available, too. 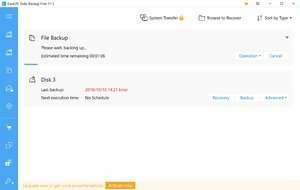 EaseUS Todo Backup Free download been highly rated by our users.